I am a really weird eater. Like picky in ways that don't even make sense. I won't eat cooked fish but I love sushi. Love all kinds of duck but hate ham. Bacon freaks me out and I don't think I have ever eaten mayo. Never had a hamburger but I regularly order conch. Weird, right? My co-workers constantly make fun of me in the teachers' lounge about my lunch time eating habits which is why they are always surprised when I come in with leftovers of non traditional foods. 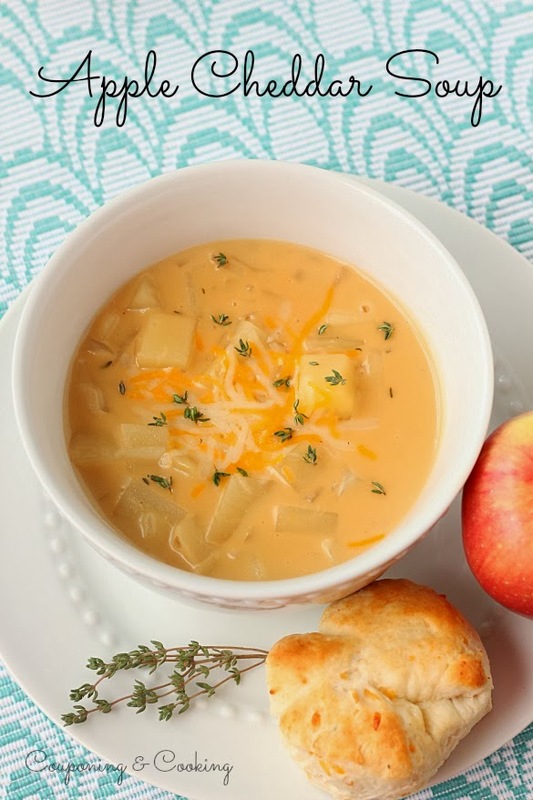 This Apple Cheddar Soup was one of the first things that I ever brought for lunch that caused them to all say, "You won't eat grapes but you like that?" And yes, I do like that. I love that. It makes me inexplicably happy. 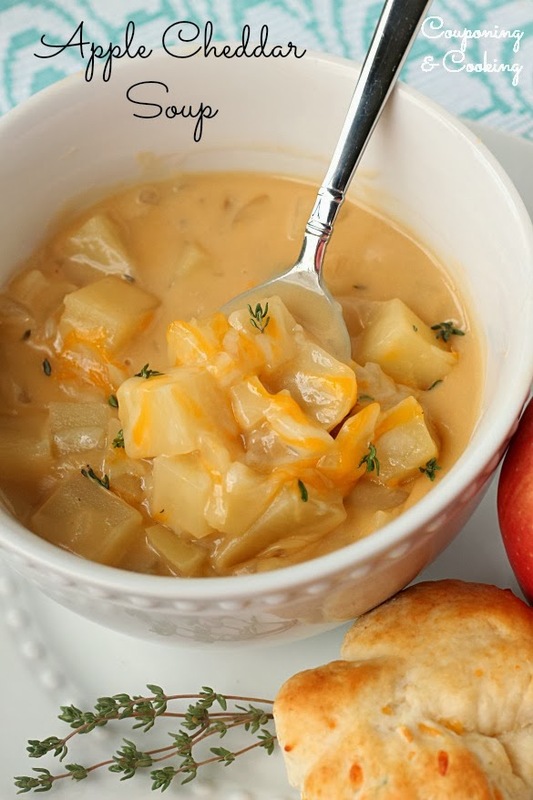 What's even better about this not so mainstream soup is that it is Fall in a bowl. I feel like I should wear a sweater and Ugg boots every time I make this for dinner, even when it is actually 85 and raining out. I personally don't find this combo to be that unusual. 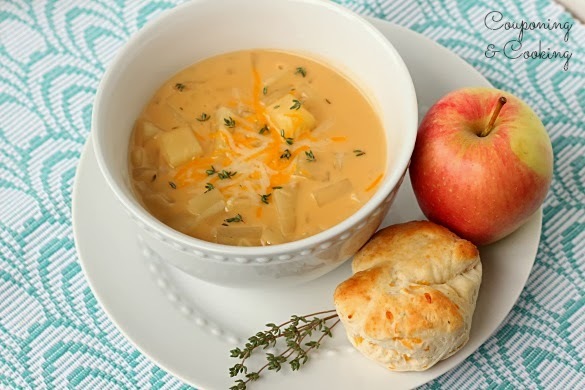 Apples and cheese are a traditional appetizer pairing and in the Midwest people are always pairing apple pie and cheddar cheese. This soup is just the dinner time manifestation of those two ingredients. 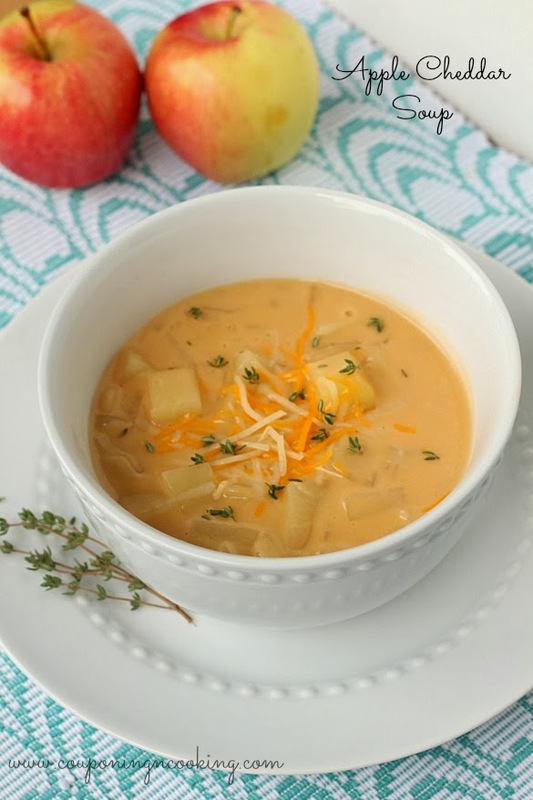 The sweetness of the apples, the heartiness of the potatoes and then savoriness of the cheddar cheese make for a bowl of pure soup perfection. We just started getting a bi-weekly organic produce share and this past week's had the most amazingly crisp Ambrosia Apples. I don't really know what the difference is between Ambrosia apples and regular red apples but whatever it is, it is worth it. I usually use granny smith apples when I make this but you can use whatever type of apples makes you happy. If you are looking for a gluten free option you can switch out the flour for cornstarch too. 1.) In large a soup pot, saute onion in butter over medium heat until translucent. 2.) Stir in potatoes, cider, thyme, salt, and cayenne pepper. 3.) Bring to a boil then reduce heat. Cover and simmer for 15 minutes. 4.) Add chopped apple, cover and simmer again for 5 minutes. 5.) In small bowl combine milk and flour and then stir into soup. Cook and stir until bubbly. Slowly add cheese, whisking until cheese is fully melted. 6.) 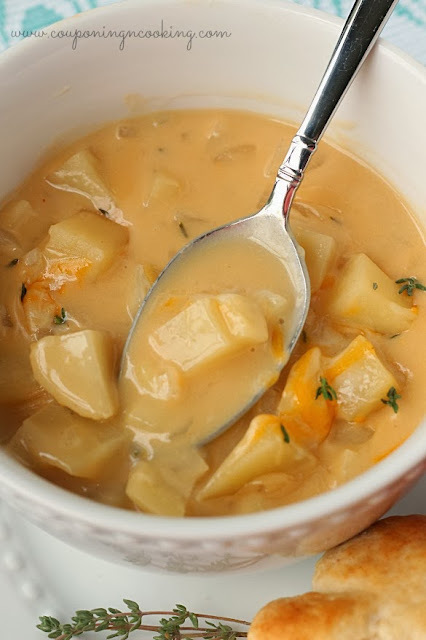 Pour soup into four bowls and top with a little extra shredded cheese. Serve warm.